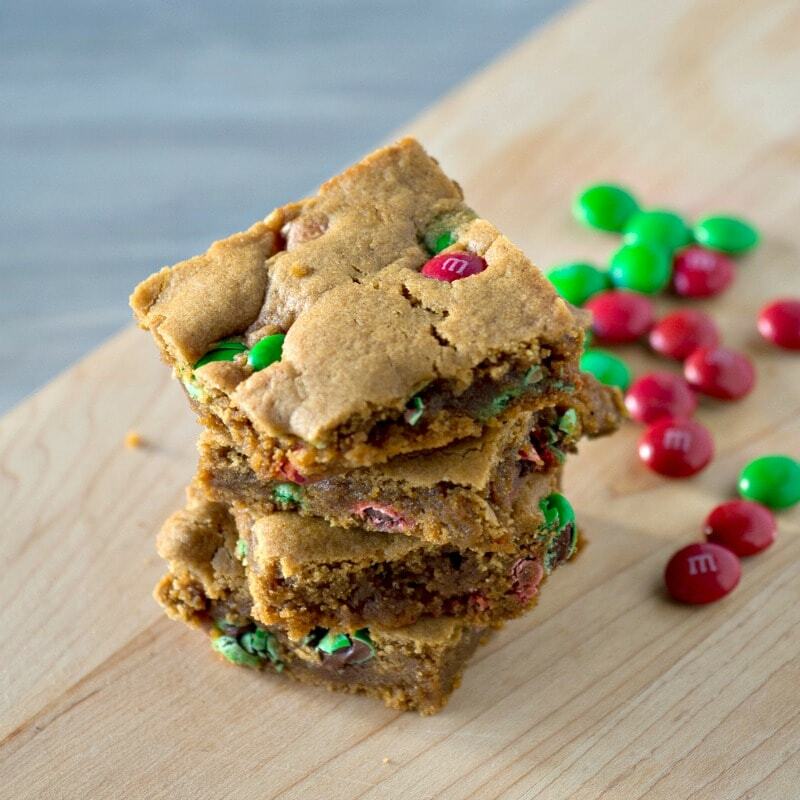 These chewy Holiday Gingerbread Cookie Bars combine rich molasses with ginger and cinnamon for a spice filled bar with added M&Ms! A quick and easy alternative to making gingerbread men for your holiday dessert table. This post contains affiliate links. As an Amazon Associate I earn from qualifying purchases. This post was orginally compensated by Collective Bias, Inc. and its advertiser, Mars Wrigley Confectionery US, LLC. One of my favorite things about the holiday season is baking. Cookies, brownies, cakes, pies – I love to bake all my family’s favorite treats while adding special holiday touches, like in these Gingerbread Cookie Bars. 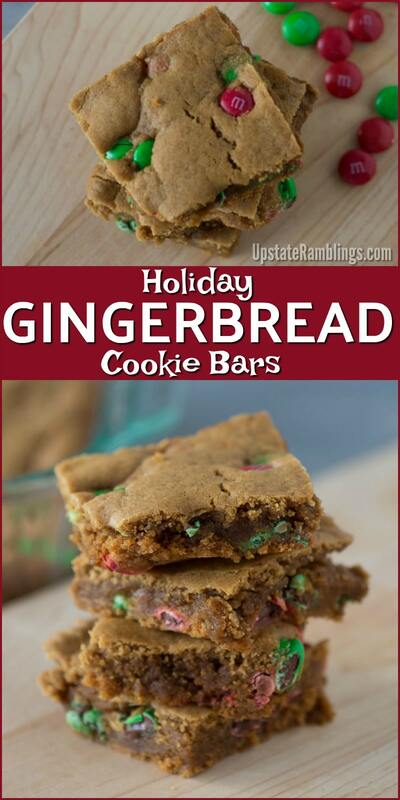 For me gingerbread is one of the classic holiday flavors that I have to make every year! My family and I always make a gingerbread house of some kind, and we enjoy making and decorating gingerbread men too. But a holiday creation like this Gingerbread Noah’s Ark takes days to make, and even rolling out and decorating gingerbread men is an afternoon long activity. Sometimes I want the gingerbread taste without the fuss, which is what this recipe delivers. 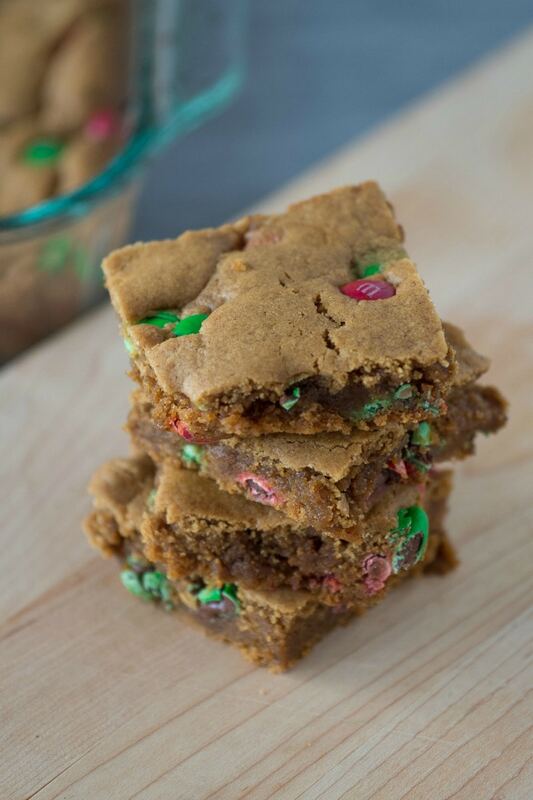 This gingerbread cookie bar recipe is quick and easy so it takes only a few minutes to deliver the subtle spices combined with molasses and the perfect gingerbread taste. This recipe is kind of like a gingerbread cake or gingerbread brownies. The recipe’s sweetness comes mostly from sugar, with a little bit of molasses added for the classic taste. This makes it a much more mild and mellow gingerbread flavor than something like my Gingersnap Cookie recipe. The mild gingerbread flavor makes it a favorite recipe for children, who might find the gingersnaps overwhelming. 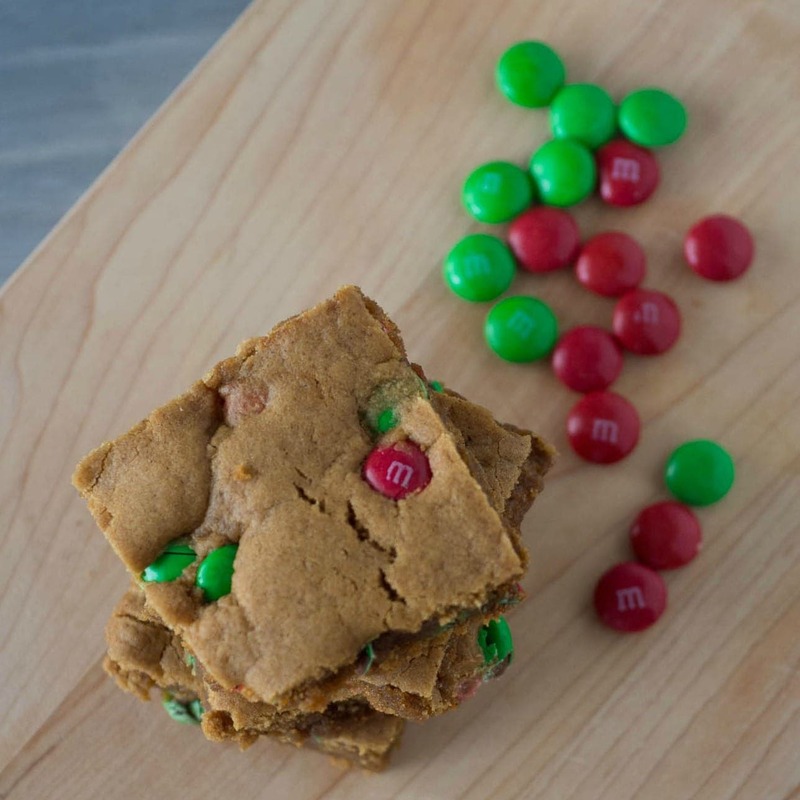 The gingersnap cookie bars are flavored with ginger, cloves, nutmeg and cinnamon, so they are still deliciously spicy. After the cookie batter is mixed I added a cup of red and green chocolate M&Ms to give the recipe little burst of chocolate flavor. You could use chocolate chips instead, but I like the added color that the holiday M&Ms provide, since they make it obvious that this gingerbread dessert is really a Christmas cookie! The batter for the bars is thick and not runny like a traditional brownie batter would be. After I scraped the batter into the brownie pan I pushed a few more M&Ms into the top of the batter. This way I made sure some of the holiday color was visible on top of the bars. 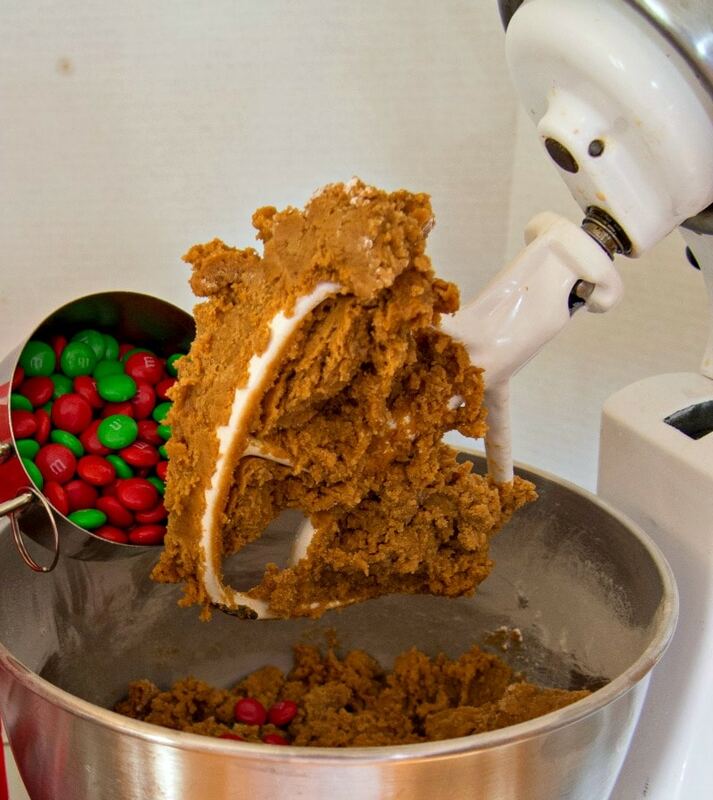 Most recipes for gingerbread cookie bars include a frosting on top of the bar. 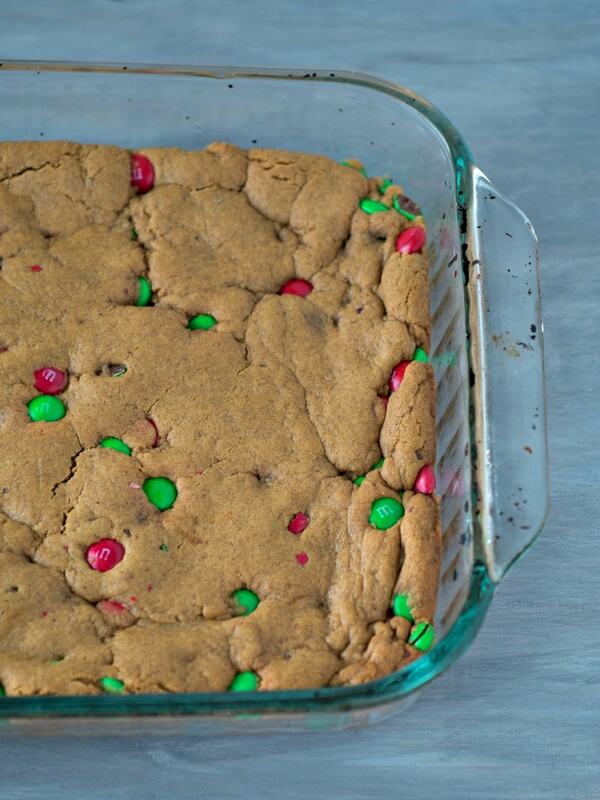 I think this would be overkill for this recipe because of the M&Ms. And I’d rather have chocolate inside my bars than sugary frosting on top, so that is how I make them. These bars make the whole house smell amazing while they bake! And once these bars have cooled and been cut into squares they are rich and chewy. 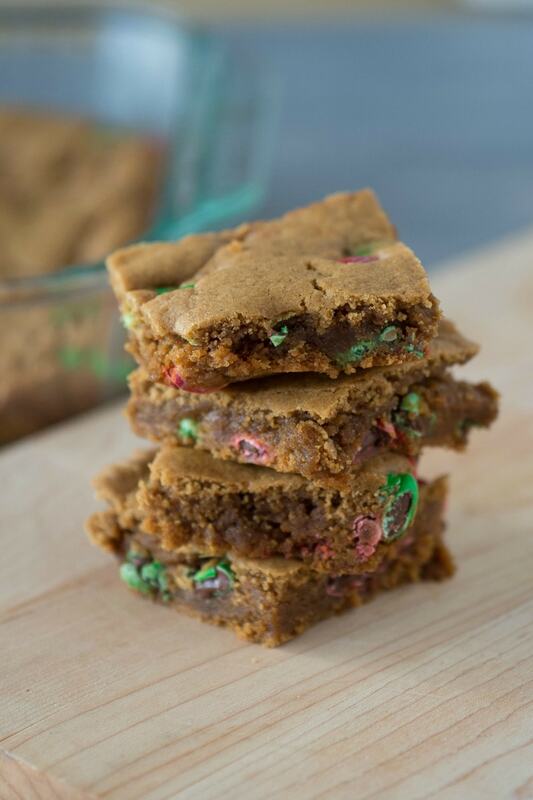 The gingerbread cookie bars provide a spicy, subtle molasses flavor with hints of ginger and cinnamon punctuated with little bursts of chocolate. These bars are also great for gifting, since they are easy to package and are not fragile. Homemade treats are my favorite gift to give friends and neighbors, and giving is what the season is all about! 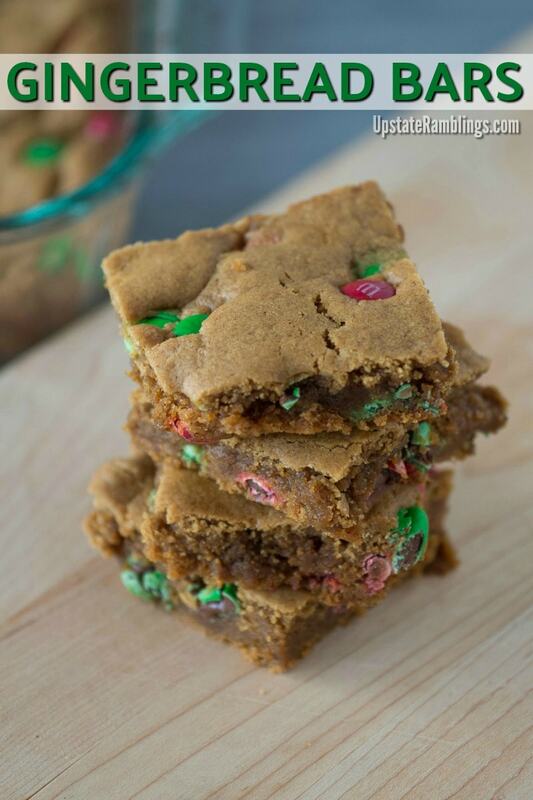 These gingerbread brownie are studded with holiday M&Ms for a delicious dessert. Combine the butter with both sugars, vanilla, molasses and egg and beat with a mixer until well combined. In a separate bowl combine the flour, ginger, cloves, nutmeg, cinnamon, baking soda and salt. Add the flour mixture to the butter mixture and mix until flour is combined. Stir in the M&M’s, preferably by hand. Make sure they are well distributed, but don't over mix or they might get crushed. Spray a 9 x 13 inch pan with cooking spray and press the batter evenly into the pan with a spatula. The dough will be stiff and not pourable. Add a few more M&Ms on top of the batter if desired. Cut into squares after the bars have cooled completely. The type of molasses used in the recipe will affect the taste. 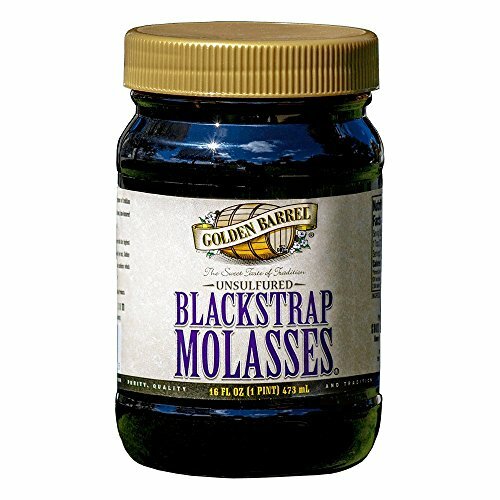 If you want a more robust flavor use blackstrap molasses. 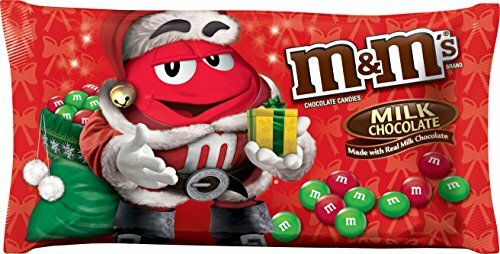 Next year I am going to make these with dark chocolate M&Ms, which conveniently also come in red and green for the holidays. I think the dark chocolate will be even tastier paired with the gingerbread.